Filed to: Science!Filed to: Science! In general, I don't give Erick Dampier much thought, and I'm guessing neither do you. He is far from an NBA superstar, and if he's at all memorable, it's only for having once been memorably overpaid. One of the most striking framing effects is the sunk-cost fallacy, which occurs when people make decisions about a current situation based on what they have perviously invested in the situation [...] Even the National Basketball Association (NBA) is guilty of a sunk-cost fallacy. Coaches should play their most productive players and keep them on the team longer. But they don't. The most expensive players are given more time on court and are kept on the team longer than cheaper players, even if the costly players are not performing up to par (Staw & Hoang, 1995). Coaches act to justify their team's investment in an expensive player rather than recognize the loss. Framing effects can be costly! On its own, this passage is funny enough—an intro to psych textbook taking shots at every NBA coach in history. But it gets better. 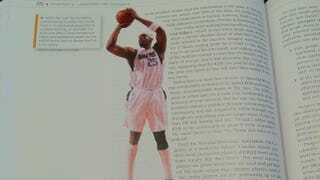 As you'll notice above, accompanying the passage is an obnoxiously large photo of Dampier from his Mavs days. (The book is from 2008.) And he's shooting the ball, as if that were some skill of his. So, apparently, even shrinks like busting on Erick Dampier. In the name of science, of course.